What has happened to parental rights in America? Why is this government overstepping their boundaries to mandate vaccines against a parents wishes, and without their knowledge? And why does the word of a professional outweigh the wants and wishes of said parents? The family unit is under attack in America in a fashion none of us would ever have guessed a scant generation ago. Children are being removed from the family unit at an astounding rate today for something as minor as a parent disagreeing with a doctors recommendation, or for simply asking for a second opinion, something we as a society were encouraged to do not so long ago. Today if a child suffers an adverse reaction, or dies shortly after a round of vaccinations, it is the parents who suffer the scrutiny or wrath of the state, with minimal to no credence being afforded to the possibility of vaccine injury. This persists even if the vaccine has a long and documented history of such occurrences. It is now up to the parents to fight for the truth with every fiber of their love and compassion for that child and (in a lot of cases) every penny in their pocket … WHY? In a country vaccinated more than any nation on this planet, why are the vaccine manufacturers never the first point of contention or investigation? Why does a state instantly pounce on parental abuse or neglect? Have we not seen the plethora of studies and historical papers written on the documented cases of adverse reactions to these very vaccines? Why does Big Pharmaceutical always get a free pass, and parents, the scrutiny and accusations? If this does not scream complicity … what does? On November 4, 2014, the website Medical Kidnap told the tragic story of four month-old Kathryn Hughes, who was stolen by Child Protective Services (CPS) after she suffered an adverse reaction to a vaccine. Kathryn was a fragile baby, suffering from a wide range of complex medical needs. Born with Pierre Robin Sequence, a condition in which an infant has a smaller-than-normal lower jaw, a tongue that falls back in the throat and breathing difficulties, Kathryn certainly has had her fair share of problems. Despite her daughter’s problems, Lorie, her mother, had always trusted the doctors and tried to do the best that she could for her daughter. The surgery went well, and despite the many tests, medications and wires, Kathryn remained a happy and secure little girl. However, despite her apparently happy disposition and the constant love and attention given to her by her mother, the reasons behind her seizures remained a mystery. Before leaving the hospital, the nurses instructed Lorie how to give Kathryn the correct dosage of medications, via the G-button, and they returned home on Thursday, September 18. Sadly, their happiness was short lived and just two days after returning home from the hospital Kathryn seizures returned and she was rushed back to the UMC. “The next day, CPS and the staff at UMC informed Lorie that they were taking custody of Kathryn over the medical condition. She was only out of the hospital’s care for two days between September 4th and the 21st. Her mother had to beg to be able to at least say goodbye. Since her kidnap by the CPS, the state of Texas has been trying to terminate all parental rights and they have reduced Lorie’s contact to just twice a month. Miss her and love her so much and would do anything to comfort her and hold her skin to skin on my chest and let her listen and relax to my scent my touch the sound of my heartbeat!!!! Sadly, Kathryn is now a ward of court and that doctors have asked the judge in her case to grant permission to vaccinate her fully, against her parents’ wishes, which, as we understand, also includes participation in an experimental ebola vaccine trial. Given her medical conditions, I feel that her life is now in danger. Did Kathryn’s mother fail to care for her daughter by failing to give her the medications prescribed as suggested, or was there something else behind Kathryn’s continued ill health and seizures? What Really Happened to Baby Kathryn? If we look at the history of this case, there is one detail that jumps out and that is the fact that Kathryn was vaccinated with the hepatitis B vaccine against her mother’s wishes. The hepatitis B vaccine can cause seizures. Their paper is full of facts and includes information written by the Association of American Physicians and Surgeons (AAPS). “’Our children face the possibility of death or serious long-term adverse effects from mandated vaccines that aren’t necessary or that have very limited benefits,’ said Jane M. Orient, MD, AAPS Executive Director. Their report had little effect. “The NVIC has studied Vaccine Adverse Event Reporting System (VAERS) data obtained under the Freedom of Information Act covering the last nine years on hepatitis B vaccine adverse events — and in 1996 there were more than three times as many reported serious adverse reactions as reported cases of the disease in the 0 to 14 age group. Of the total 2,424 adverse event reports made between 1990 and October 1998 in children under age 14 who only received hepatitis B vaccine, there were 1,209 serious events and 73 deaths. Thus, one half of the reports for children under age 14 who received only hepatitis B vaccine were for serious events that required an emergency room visit, hospitalization, or caused life-threatening health problems or permanent disabilities. “At the NVIC, we are overwhelmed following up constant new reports of deaths, seizures and autoimmune reactions following hepatitis B vaccination. Because the CDC refuses to acknowledge this large number of serious adverse reactions, hospitals and doctors who have been misled about the risks continue to administer the vaccine and then deny any vaccine connection when children die, get ill or have seizures within hours or days. CDC officials tell parents they have never heard of hepatitis B vaccine reactions. “As the hepatitis B compliance rate in newborns has gone up in our community, so has the percentage of damaged children. This is very alarming. Because of having so many damaged children we have tried to find the long-term clinical trials that ruled this vaccine “safe and effective”. We discovered through an exhaustive Medline search that the FDA based its decision to approve hepatitis B vaccine for administration in the first hours of a newborn baby’s life upon clinical trials and upon post-marketing surveillance studies in which patients and their doctors were asked to report any adverse effects they noticed within 4-5 days after each injection [4 days for SmithKline, 5 days for Merck]. In other words, she believed that the vaccine damage suffered by these children fell into two categories: it was either autoimmune or neurological in origin, and, through its very nature, was unlikely to show up for several weeks or months after the vaccination. 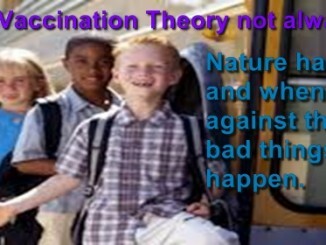 If White’s statement is true, and there is no reason to suggest that it is not, there is evidence to suggest that new born babies are being vaccinated with a vaccine that has not been fully tested for its safety or its long-term efficacy. Looking back at the number of professionals raising concerns over this vaccine, one has to wonder whether or not Kathryn should have been vaccinated in the first place. After all, Kathryn had already had her fair share of medical problems and a mother who had reacted adversely to vaccinations. For many years, I have been writing about such cases. There are now a growing number of parents who have been falsely accused of harming their vaccine-damaged children. Sadly, this case is yet another example. Loving, caring parents are having their children taken away from them because the majority of health care professionals and social workers are burying their heads in the sand and choosing to ignore the fact that no vaccine or medication is one hundred percent safe. All vaccines have the potential to cause adverse reactions. When you have such groups as the AAPS stating, “And yet, children under the age of 14 are three times more likely to suffer adverse effects — including death — following the hepatitis b vaccine than to catch the disease itself,” you have to wonder what on earth is going on. This story highlights the need for reform and the need for change. It is highly unlikely that this mother harmed her baby, and in my opinion, this baby should be returned to her mother as soon as possible. If readers would like to help Baby Kathryn be returned to her mother, her family has found a competent lawyer and they need to raise $20,000. Please see the GoFundMe campaign titled Bring Baby Kathryn Home and consider giving as generously as you are able.You can also like and share the Facebook page Bring Baby Kathryn Home or follow Kathryn’s story on Twitter.Please sign the petition asking Governor Rick Perry and Governor-Elect Greg Abbott to intervene on Baby Kathryn’s behalf. TLB recommends you visit Vactruth for more pertinent articles and information.